The Romanian Cultural Institute and the Victoria and Albert Museum (V&A) are proud to launch the joint anniversary programme “Trajan 1900” celebrating 1900 years from the dedication of Trajan’s Column in Rome, a timeless and crucially important monument for Romanian history, identity and heritage. Concurrently, the programme celebrates 140 years from the opening of the Museum’s Casts Court in 1873, purposely built to host a unique, massive cast of the original marble column in Rome, acquired during Queen Victoria’s reign. The programme is the first major partnership between the Romanian Cultural Institute and the prestigious V&A, with the support of the Romanian Embassy in London. Spanning over one month, “Trajan 1900” consists of six events taking place both at the Institute and the V&A, including film screenings, exhibitions and academic lectures. The most spectacular piece is a live video mapping of the Column in the Casts Court, with sound, performed by two of the most imaginative Romanian artists of today, Dreamrec and Rochiţe. A special preview of the son et lumiere event will take place at the V&A in the presence of Mr Professor Martin Roth, Director of the V&A, HE Dr Ion Jinga, Ambassador of Romania to the UK, Mr Liviu Jicman, Vice-President of the Romanian Cultural Institute, and Mr Dorian Branea, Director of the Romanian Cultural Institute in London. Public viewings will then follow in December and January. 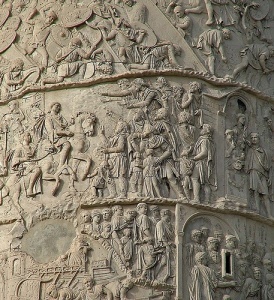 Trajan’s column, erected in AD 113, stands in the Trajan's Forum, built near the Quirinal Hill, north of the ancient Roman Forum in Rome, and is a commemorative monument decorated with marble reliefs illustrating Emperor Trajan’s two epic military campaigns in Dacia (modern Romania). The continuous frieze of carvings winds up around the column from base to capital, in a spiral, the lower half portraying the first war (101–102), and the top half depicting the second (105–106). At the end of two bloody wars, between AD 101 and 106, despite the heroic resistance of the Dacians led by their king Decebalus, Trajan conquered Dacia, establishing here a Roman province of extraordinary wealth. With his capital Sarmizegethusa occupied and destroyed, Decebalus committed suicide to avoid the humiliation of Roman captivity. Trajan’s Column was the first of many such celebratory monuments and its design has inspired numerous victory columns, both ancient and modern. It is also an invaluable source of information, no less for the history of Romanians, with over 2,500 figures carved in the relief spiralling around the column, in a lively 200m long narrative of key scenes in which Trajan and Decebalus themselves are present in diverse situations such as leading the army, judging prisoners, and holding councils of war. 3D photography exhibition by architect Matei Filip portraying the dramatic narrative of the Dacian Wars, with sound by Rochiţe | Opening 21 Nov, Romanian Cultural Institute, 6.30pm. Free. More details. UK premiere of Mircea Drăgan’s iconic film “Columna” (1968), followed by Q&A with leading actor Richard Johnson | 21 Nov, Romanian Cultural Institute, 7.30pm. Free. More details. 23 Nov, V&A, Seminar Room One, Sackler Centre, 2.30pm. Free. More details. 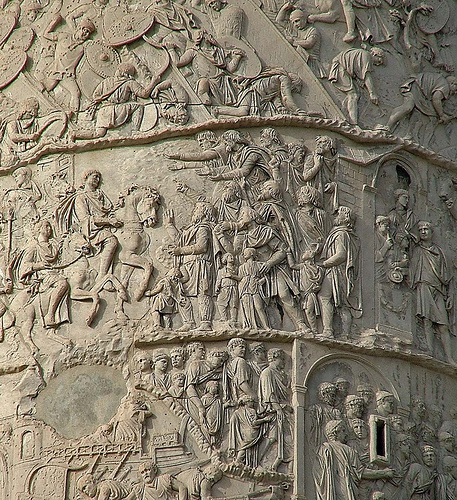 Video mapping on the cast of Trajan’s Column by Dreamrec with sound by Rochiţe | 22 Nov (private view, by invitation only), 6 Dec & 17 Jan 2014, V&A, 6 – 10pm. Free. More details. Join us for a contemporary, vibrant take on 1900 years of history!